This HD electronic gummed paper tape dispenser handles wider rolls of paper tape and has easy to use electronic operation with colour coded buttons. Designed for heavy duty use and effortless operation, this electronic tape dispenser is a rugged workhorse that excels in demanding work environments. 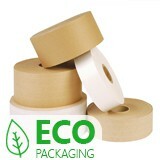 The unique 100mm (4 inch) wide tape capacity provides a strong, secure, sustainable seal, which makes it ideal for packages containing heavy bulky items. For fast electronic tape dispensing, the smooth-touch, colour-coded key pad is easy to use with tape from 25-100mm wide. Please specify if machine use is for standard or reinforced tape, this will be configured prior to delivery. Easy open gummed paper tape - impress your customers!